Bungonia National Park has some of the best bushwalks in Australia, The Bungonia Gorge is a must to see. Where: Bungonia National Park, Adams lookout. Bungonia National Park took me by surprise. On my weekly trips to Canberra I like to check out what some of these small towns have to offer. So I took the turn off and headed towards Bungonia National Park. What a gem. The first lookout I went too was Jerrara Lookout to view the waterfall. It was sensational. Nice big drop into a massive canyon. So far so good. I then went on a short walk to Adams lookout seeing plenty of wallaby’s on the way. I thought Jerrara Falls was good. But this was something else. The view was of the 300m Bungonia Slot Canyon created by the river carving up the limestone cliffs and Bungonia Creek Gorge was one of the best lookouts I have either seen. All I could think off was how come I’ve never heard of this place. It’s amazing. Time was getting away from me as it was getting dark. But I decided to drive down to the Bungonia lookdown to have a peek. 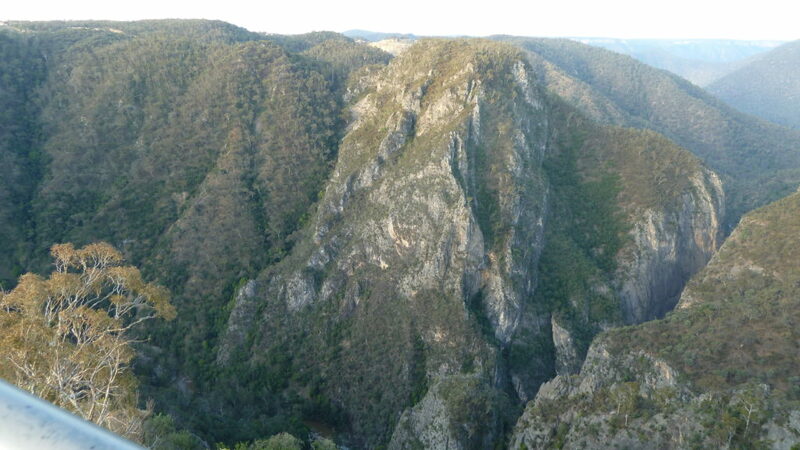 This was another awesome view looking over Bugonia Creek Gorge. Magnificent. I forgot to turn off the map tracker so you have a bit of driving on the map below. But you can see all the walks to the lookouts are short and easy access. Bungonia also offers excellent bushwalks catering for all levels. I’m coming back here in a few weeks time to tackle the Red Track. It goes down to the slot canyon so will be a massive effort to get down there and back up. There is also a green track which appears to be a bit easier. I intend to do both in the very near future. So watch this space. Google Maps Link. Click on the google maps link to open google maps for directions. When you drive into Bungonia National Park you’ll be on the The Lookdown Road. Drive for a bit and turn left onto Adams Lookout Road. The area is well sign posted. Youtube clips of Bungonia Lookout. Bugonia National Park, bushwalks, bush walk, hike, trek, trails, track, lookout, waterfall, canyon, bungonia gorge, southern highland bushwalks.